Gen. David Petraeus said he thinks there is still time to engage in diplomacy with Iran. Tampa, Florida (CNN) -- In addition to diplomacy and sanctions, the United States has developed contingency plans in dealing with Iran's nuclear facilities, a top U.S. military commander told CNN's Christiane Amanpour. 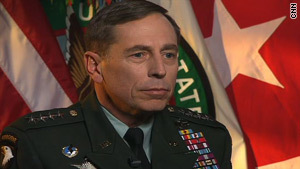 Gen. David Petraeus, head of U.S. Central Command, did not elaborate on the plans in the interview, to be aired Sunday. But he said the military has considered the impacts of any action taken there. "It would be almost literally irresponsible if CENTCOM were not to have been thinking about the various 'what ifs' and to make plans for a whole variety of different contingencies," Petraeus told Amanpour at the command's headquarters in Tampa. Iran's nuclear program has become a thorn for the United States and its allies, and Washington has sharpened its tone on dealings over Tehran's program. The Islamic republic maintains the program is for peaceful purposes, but the United States and other Western nations fear Iran wants to acquire nuclear weapons. Israel has called Iran's nuclear program the major threat facing its nation. When asked about rumors that Israel could attack Iran's facilities, Petraeus declined to comment about Israel's military capabilities. But when asked about the vulnerability of the facilities, Petraeus said Iran has strengthened the facilities and has enhanced underground tunnels. Still, the facilities are not bomb-proof. "Well, they certainly can be bombed," he said. "The level of effect would vary with who it is that carries it out, what ordnance they have, and what capability they can bring to bear." Iran is holding out on a United Nations-backed deal on its nuclear program that includes enriching uranium. The country had until the end of 2009 to accept the deal offered by the "P5 plus one" -- permanent U.N. Security Council members Britain, China, France, Russia and the United States, plus Germany. Instead, Iran countered, giving the West until the end of January to accept its own proposal. The general said he thinks there is still time for the nations to engage Iran in diplomacy, noting there is no deadline on the enactment of any U.S. contingency plans. He added, however, that "there's a period of time, certainly, before all this might come to a head, if you will." Christiane Amanpour's interview with Gen. David Petraeus airs Sunday at 2 p.m. ET on CNN.